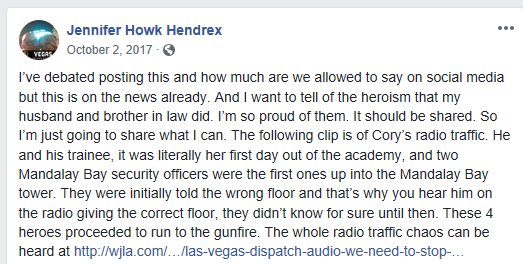 LAS VEGAS — Jennifer Howe Hendrex, the wife of Las Vegas Metropolitan Police Department Officer Cordell Hendrex who failed to confront gunman Stephen Paddock on October 1, 2017, called her husband a hero in several Facebook posts shortly after the Las Vegas Massacre. In his report Hendrex said that on October 1, 2017 he and his day-2 trainee, Officer Elif Varsin, along with armed Mandalay Bay security personnel were on the 31stfloor of the Mandalay Bay Hotel hearing the gunshots emanating from the 32ndfloor as Paddock was actively killing and wounding helpless concert attendees at the Route 91 Music Festival. No action was taken to stop Paddock. Apparently, Jennifer Hendrex was not fully aware of all the facts as stated in her husband’s report. She never mentions terrified with fear, froze in the hall for how long he can’t say, hesitated again and did not know what to do next. All the while people were being slaughtered across the street. “The police were actually on the premises of Mandalay Bay taking a crime report and when the initial call came out, the call came out as an active shooter at the concert venue. So, those two officers along with several security people from the Mandalay Bay began to run across the street where they thought the shooter was from. Well at the same time this was taking place, the suspect was breaking out, had broken out the glass and it fell down into the Valet area. The valets looked up, they saw, they heard the gunfire and they reported the approximate location of the shooter. Now at this point, these, the two officers, one of them is a brand-new police officer, ran back into the building, went up to the 31stfloor, and at that point the other security officer had gotten separated, gone up to the 32ndfloor and was shot. The other officer, the Metro officer at that point, the shooting had stopped. They went into the stairway and they isolated the room, isolated the hallway preventing any type of escape, also being cognizant of any other shooters because remember during all this madness, came out there were other shooters taking place as well. So, these officers secured that hallway making sure that no one came or entered until the SWAT team could get there. Now the reason for that time period, they were back on the scene in about 12 or 13 minutes, but the shooting had stopped. He was apparently, from my time reference here, right after the security guard was shot, I think that Paddock turned the .357 on himself and took his own life.” [Note: There are several inaccuracies in Sutton’s account]. I also reviewed the Sean Hannity Radio Show for October 5, 2017. Sutton was also a guest on that show. He related the same information as he did on Lou Dobbs the following day. On October 2, 2017 Ret. LVMPD Lt. Randy Sutton was a guest on another Fox News show. He said, “It’s spirit, it’s the warrior spirit that is so important in police work.” I agree, however when lives are being taken by an active shooter a true warrior would not retreat, freeze, hesitate and then say that he didn’t know what to do. You do what you must do to protect lives, you jeopardize your own life if necessary to save others. LVMPD K-9 Sgt. Joshua Bitsko said, “But at least if he [Paddock] was shooting at us, he wasn’t shooting at Casey and all the victims down there at the concert.” Well said, Sgt. Bitsko, that is the warrior spirit. Eight months out and we still don’t know the truth. Sheriff Joe Lombardo isn’t it about time the public hears from you on this matter or are you going to continue to cover-up the true details of what happened with Officer Hendrex. You have done that for eight months; times up. 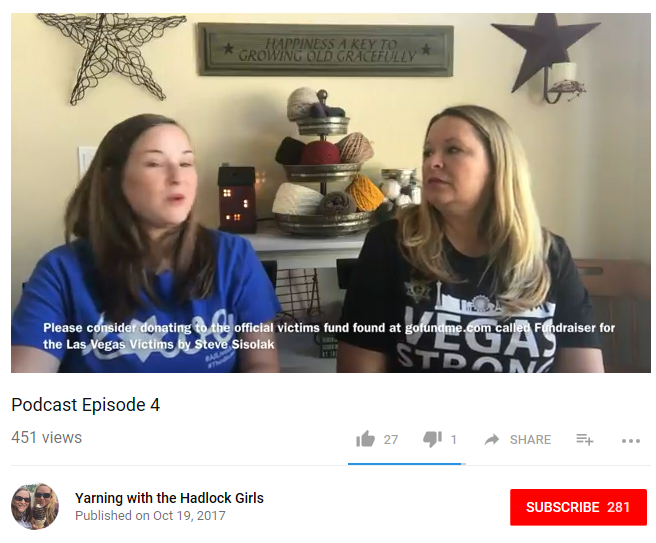 What’s also wrong with the Hendrex incident is that when the Mandalay Bay armed security personnel were being interviewed during October 2017 by the LVMPD detective and the FBI, the interviewers must have known that something was amiss. One Mandalay Bay security manager said Hendrex was on the 32nd floor with him while Paddock was firing. Police protocol would dictate that the detective had to notify his superiors of the result of the interviews and they must have read Hendrex’s report. And what about the FBI? Did they participate in this cover-up also? Let us never forget the 58 people who died the night of October 1, 2017, and the more than 400 others who were wounded during Paddock’s gunfire. 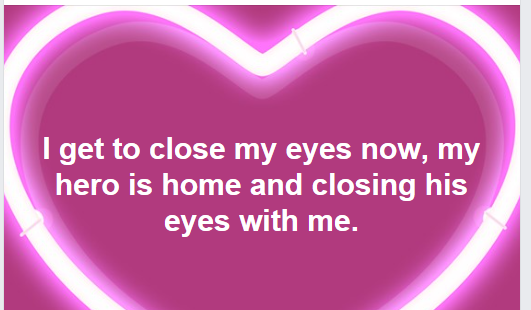 Again, besides the attorneys who file for court-ordered disclosures, will anyone (including Poppa) find a powerful way to insist on complete expedited disclosure?? We read Poppa here, and we hear Carlson on Fox sometimes – but where is strong action ahead of the Sheriff vote? What’s the date lock interrogation is released? Why are we still not reading about what was found within the two suites (ladies stuff much? 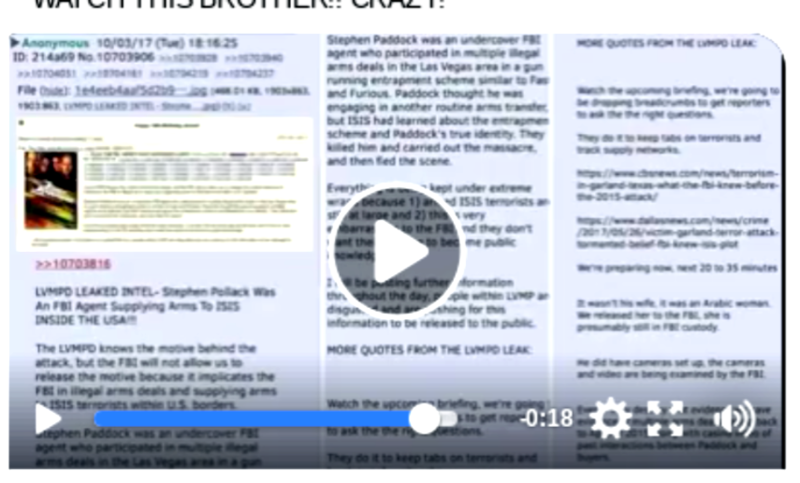 ), ballistics, anyone else staying on 32nd or near, MGM CCTVs, obelisk CCTV, re-interviewing inconsistent witnesses… Are we accepting Police Dept and FBI abhorrent delay tactics? Wow-this is what happens when self-promoters or mouth-pieces don’t have the facts right. They wanted their ‘face’ time and to capitalize on the tragedy but they risk the fact that they may later look foolish and fooled! So you have an OPINION; it’s an observation for sure, that perhaps, some “self-promoters or mouthpieces” don’t have the right facts. You must be referring to Lt. Sutton? Since we never, ever give up our weapons, there comes a moment in time throughout a police officer’s career when we have one or five seconds to MAKE a decision, then we must ACT upon that decision, and it was “a life or death” matter for every single officer who had no idea “how many” shooters there were; had several distinct and often varying types of calls coming in and where and how must they prioritize the information as it flew in? WHICH ONE do you respond to? Why? Remember folks – there is absolutely one, and only one call, upon which you must go, so good luck!